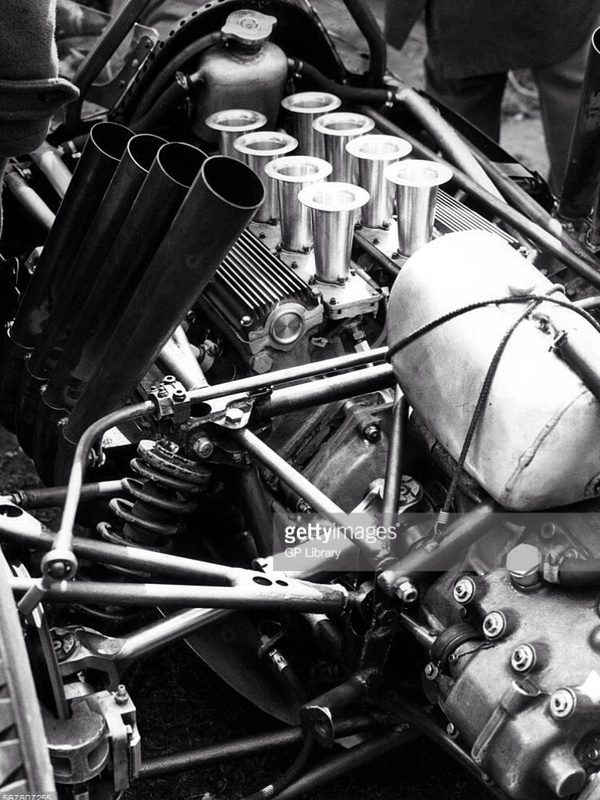 This series of engines was immensely successful being competitive throughout the 1961-5 1.5 Litre F1 and was ‘stiff’ not to have won the title on multiple occasions. Later in its life it became, in 2 and 2.1 litre capacities an effective Tasman Series weapon. 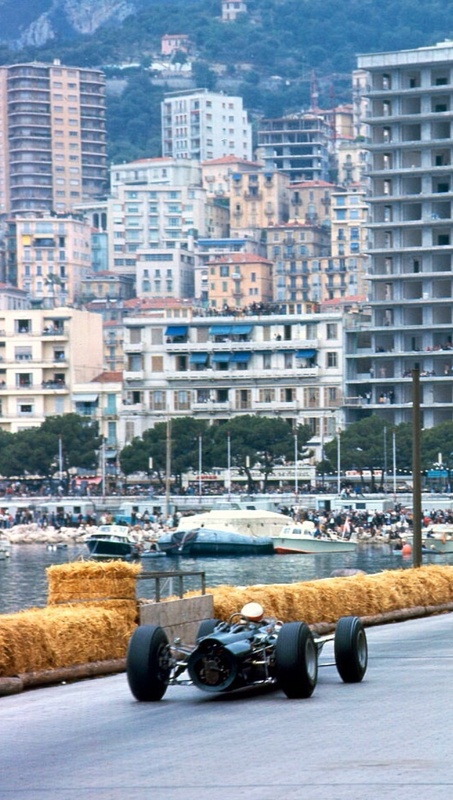 It was victorious at 2.1 litres against new 3 litre cars winning the ’66 Monaco GP Jackie for Stewart that May. It is one of Grand Prix racing’s great engines. This is the first in an occasional series of articles focussing on engines, mind you, as usual its longer than intended. As is the case with most of my stuff the article is a function of a great photo (above) inspiring the piece rather than me thinking strategically about the relative merit of one engine to another in a particular era! 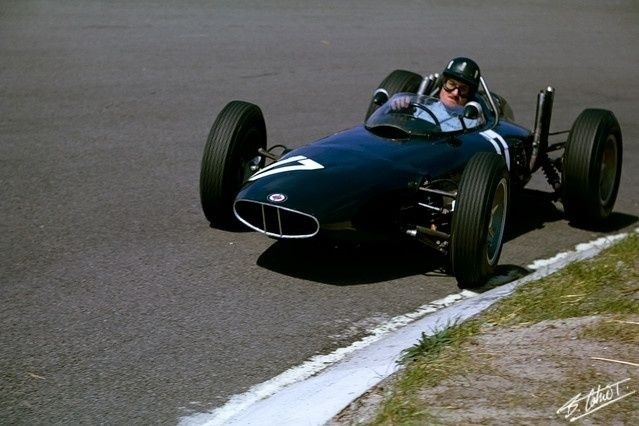 BRM commenced the new 1.5 litre F1 in 1961 by using a Coventry Climax FPF Mark 2 engine, it’s ‘Project 56’ 1.5 litre V8 started late and was running behind schedule. The teams long serving but ‘too dilettante’ technical director Peter Berthon was ‘shunted sideways’, seconded to work at the Harry Weslake Research consultancy in Rye, 280 km away leaving Tony Rudd, his assistant in charge. By the time this 1960 Dutch GP change was effected Berthon, with the assistance of consultant engineer Charles Amherst Villiers an old school friend of BRM founder Raymond Mays and a long term associate of Berthons too, was already laying down the conceptual design and detailing of P56. The Shell oil companies research boffins also contributed their knowledge via a project they were completing at the time on ‘combustion in high speed transport engines’. A core conceptual design foundation was efficiency at extremely high RPM by the standards of the time, and, for the first time for BRM the engine was to be offered for customer sale rather than just being a ‘works engine’. There was money to be made, as Coventry Climax had proved in recent years by flogging engines to those with the ‘readies’, at Sir Alfred Owen’s insistence BRM were to contest that customer market. 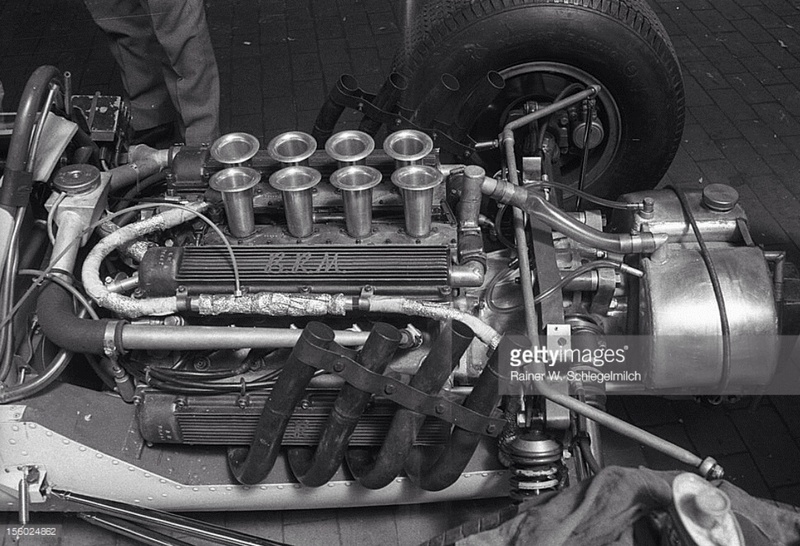 In keeping with the BRM charter of using British suppliers if at all possible, Lucas’ new fuel injection system was chosen. 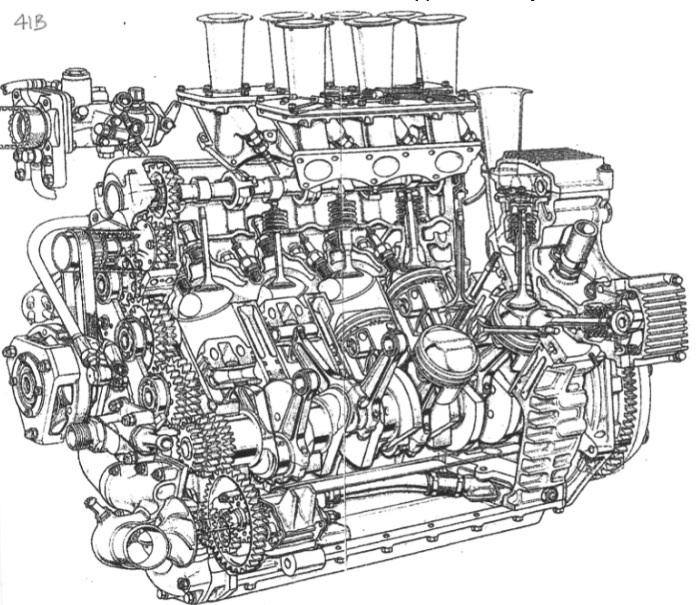 Several design features of the old V16 were used including its timing gear, camshaft drives and similar con-rods, higher inertia loads of heavier pistons (than the V16) involved different big-end bolt arrangements though. The engine is a 90 degree V8 with a bore and stroke of 68.1 X 50.88mm for a capacity of 1498cc, it’s heads and block cast in LM8 aluminium alloy. The sump was magnesium and the crank machined from nitrided EN40U alloy steel and ran in 5 Vandervell, 2.5 inch wide plain metal bearings. 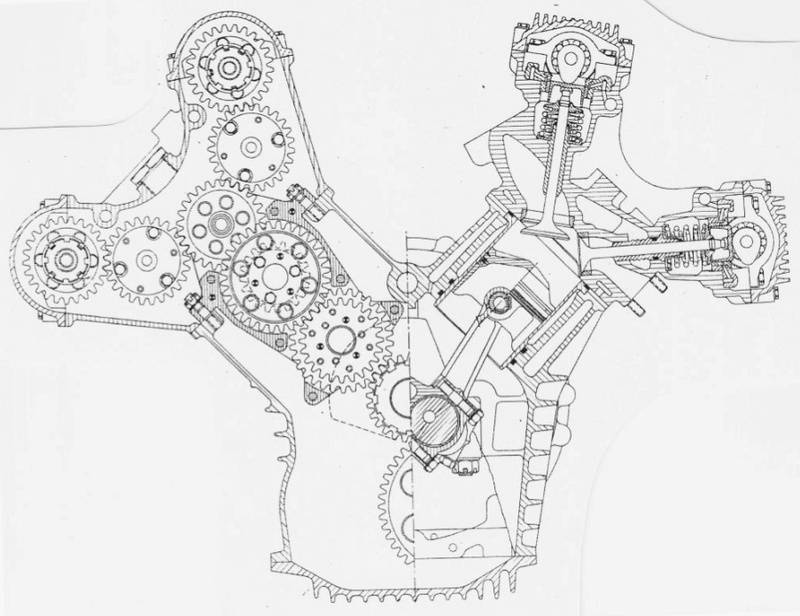 The cams, water pump and distributor for the transistorised ignition system were driven by gears off the cranks nose. Two ring die-cast pistons and forged con-rods were used initially but forged pistons with a different profile were experimented with later in the successful search for more power. Results justified Berthon’s original concept of minimising rotating and reciprocating mass with a very ‘over-square’ bore/stroke ratio by the standards of the day to facilitate high RPM. Up top the four cams ran in 5 roller bearings operating 2 inclined valves per cylinder via inverted tappets. Valve sizes were 1.5625 inch inlet set at 45 degrees from the bore axis, and 1.20 inch exhaust set at 30 degrees. Double valve springs were used and proved effective even at 11000rpm, the valve-gear was designed for a maximum of 13000rpm. The Lucas new fuel injection system was of the port type, throttle slides were used after early butterfly throttles were tried and rejected. The compression ratio using mandated 100 octane fuel was 11.5:1. The fuel injected works engines claimed 10bhp more than the Weber carbed customer units in the first year. The metering unit was driven by a toothed rubber belt. Lucas also provided the transistorised ignition system made necessary by 11000 rpm; a conventional coil setup produced around 400 sparks per second, a magneto 500 whereas the BRM needed 733 sparks per second at 11000 rpm, which the Lucas transistors achieved. Ignition timing was controlled by pole pieces mounted on the back of the flywheel in conjunction with a magnetic pick-up on the engine backplate. Current was provided by an alternator driven from the right-side inlet cam. The prototype P56 engine ‘5601’ was assembled at Bourne in June 1961, without starter motor weighing 251 pounds, on 12 July in the Folkingham Aerodrome test house it first burst into life. A second engine was built and run at Monza, in practice only in 1961. That engine ‘5602’ produced over 184bhp. During 1962 maximum power was 193bhp@10250rpm, the engines dyno curves showed 110@6000, 150@7500, 173@9000 and 190bhp@9750rpm. At Monza in 1962, Hills victorious P578’s P56 engine achieved 10.6 MPG. Initially the engines were fitted with separate individual megaphone exhausts raking back at near to vertical on each side but they fatigued during a race and progressively broke. 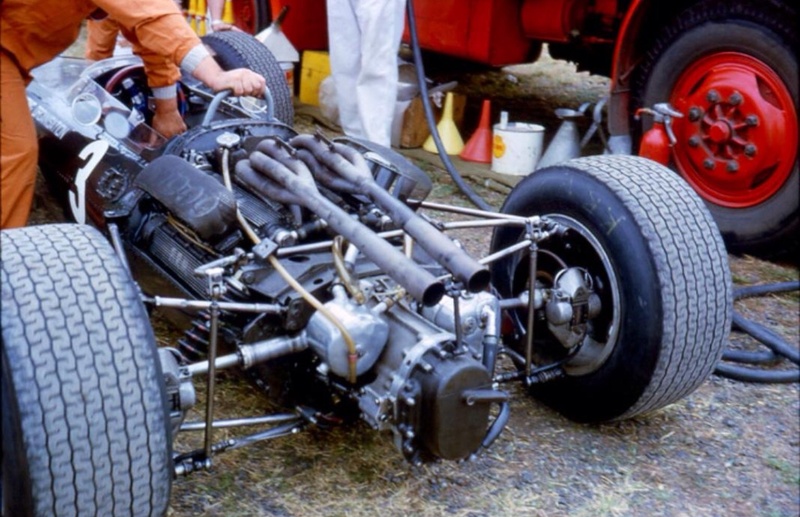 A low level system made its debut at Spa in 1962 but by then the ‘Stackpipe BRM’ label had stuck! A cross-over exhaust and ‘flat plane crankshaft’ liberated a bit more power as did new Shell low viscosity oils, by February 1963 the works engines gave 200bhp from 9750-10500rpm. Four valve heads were tried for 1964 but ‘flopped fearfully’. Reversed port two valve heads and between the Vee exhausts at the Italian GP provided 208bhp @10750rpm. Eventually by filling combustion chambers with weld and re-machining, trial and error stuff engine ‘5618’ produced 220bhp@11750rpm this engine was used by Hill at the 1965 BRDC Trophy and became his regular engine thereafter ‘maxing’ at 222bhp. 1965/6 1880cc, 1966 1916cc, 1966-7 1998cc and 1966-8 2070cc. The P56 and its big P60 brother was a remarkably long-lived engine at International level, let alone its national level wins. 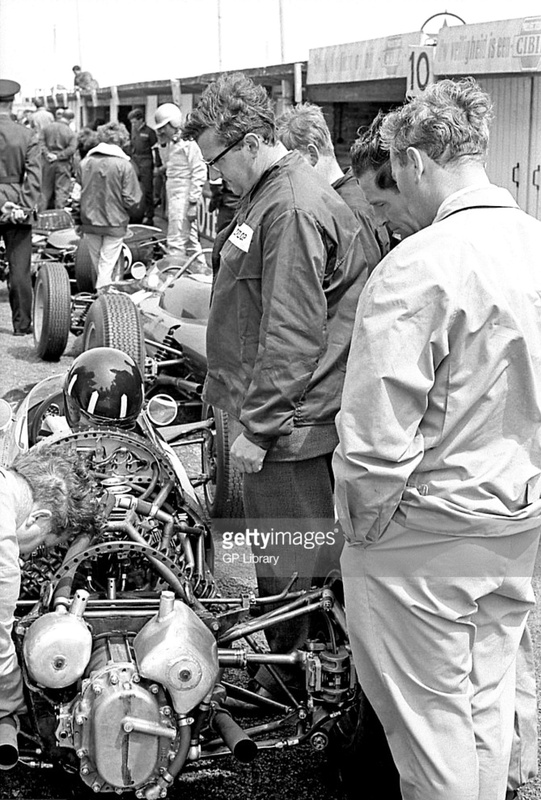 The engines first International win was in the rear of Graham Hill’s BRM P57 in the 1962 Brussells GP on 1 April, its first Championship GP win the Dutch on 20 May 1962, its last Jackie Stewarts 1966 Monaco GP victory in 1966 amongst the new 3 litre GP cars. 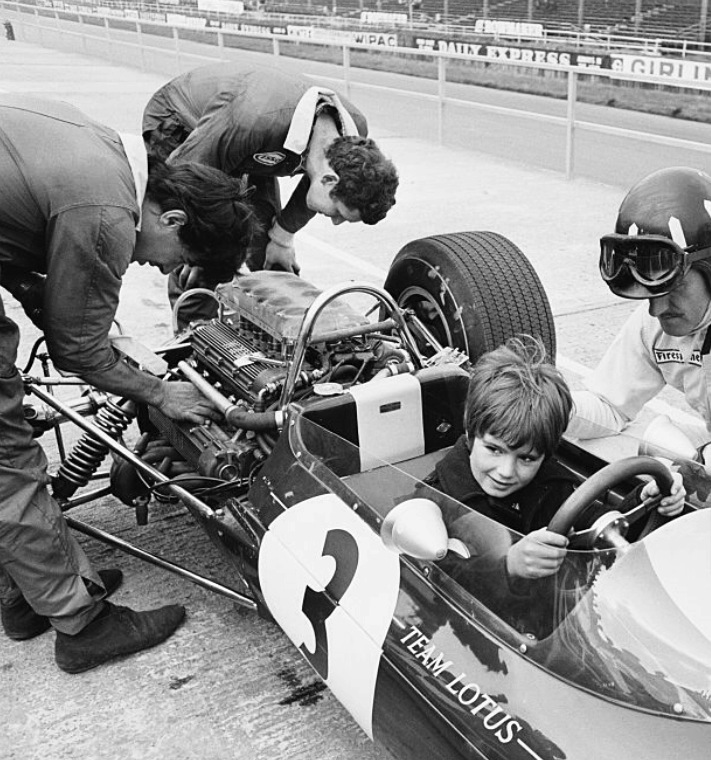 Jackie Stewart also scored the engines last International win in taking the Australian GP at Warwick Farm on 19 February 1967 in his BRM P261. 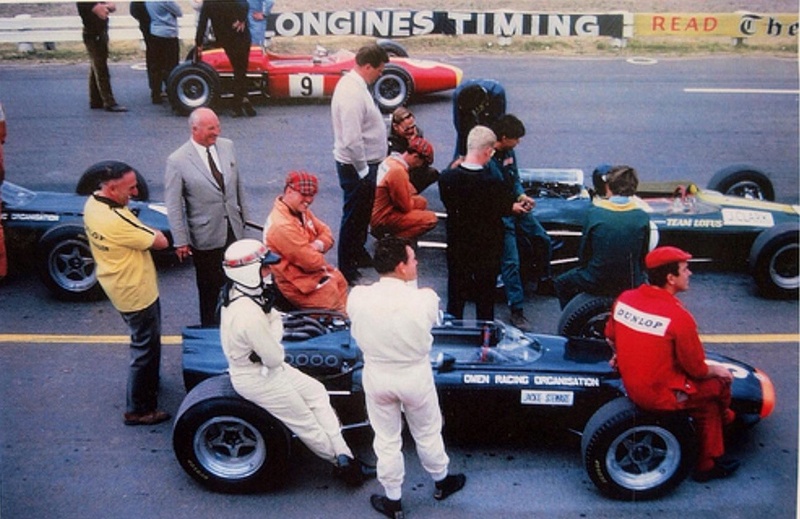 The engines final entry as a ‘works engine’ was in the back of Pedro Rodriguez’ P261 at the Longford Tasman round in March 1968, he was second to Piers Courage McLaren M4A FVA. 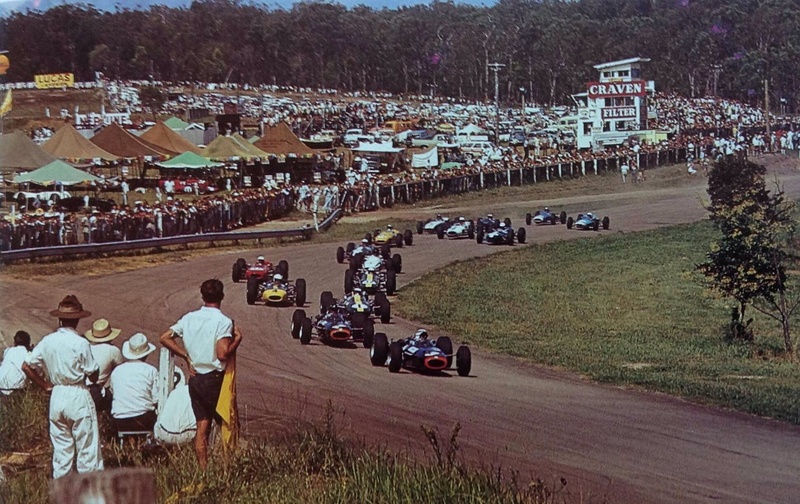 During that period the engine won the ’62 Drivers and Constructors titles with Hill. Hill/BRM were second in both the drivers and constructors titles in ’63 to Clark/Lotus in ’64 to Surtees/Ferrari and in ’65 to Clark/Lotus. 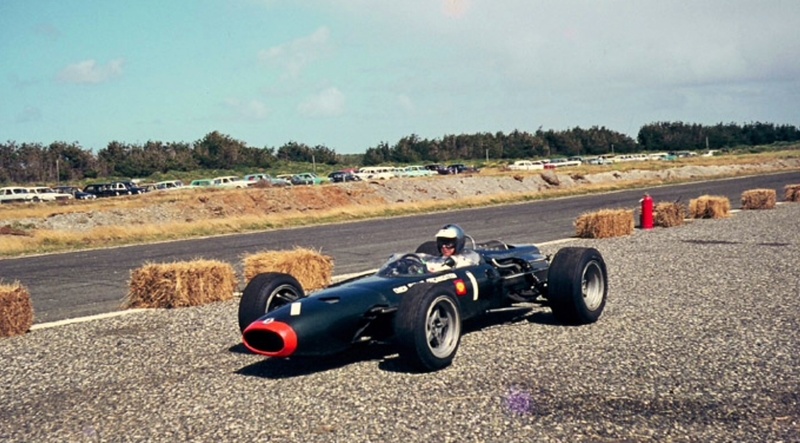 The BRM P261 won the 1966 Tasman Championship for Jackie Stewart in a dominant display, BRM won 7 of the 8 rounds.